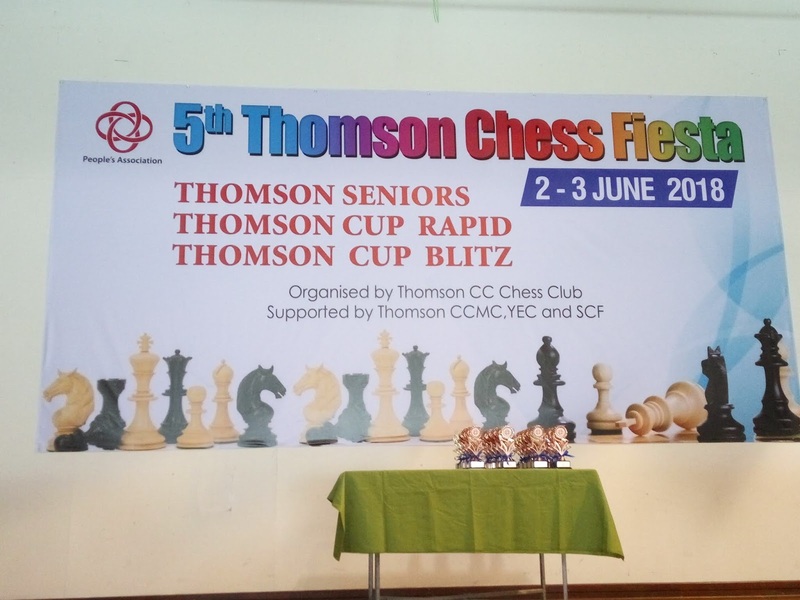 The Thomson Chess Fiesta 2018 concluded almost a month ago, and due to its unfortunate clash with the SG Open, participation was relatively low. Nevertheless, it was a refreshing comeback for me. 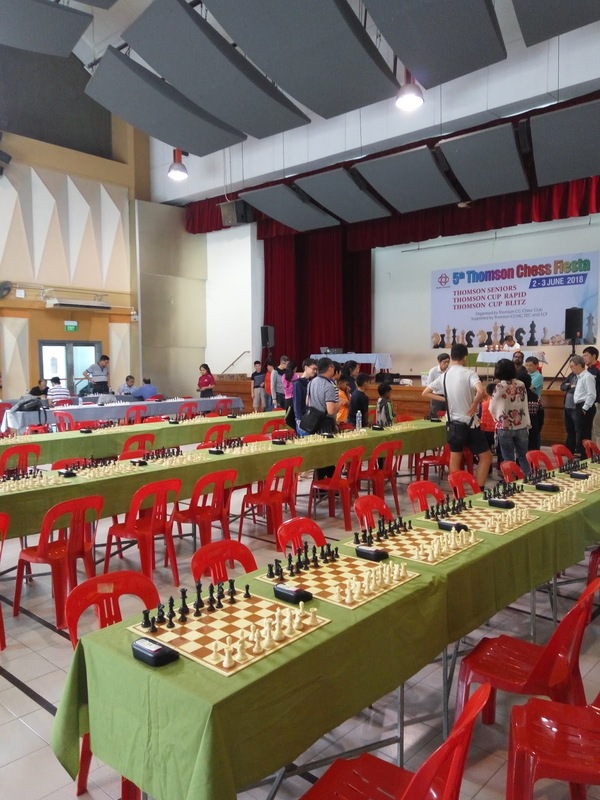 My last tournament was more than half a year ago (excluding QCD, which can’t be counted as a full-day tourament) and I managed to play some very good games despite having to withdraw on the second day. Overall it was a satisfactory tournament run (spoilt only by that thrown win in Game 3), which was soon followed by my participation in the recent Queenstown Club Tournament 2018. Perhaps, when I can next time find in my busy schedule, I will post more highlights from that event here. Round 2: I think you equalised from the opening rather effortlessly, which is great for Black. I don't feel like Black was in any major trouble at all. After 15...Qf6, I think 16.Nd7 would win material through forking Black's major pieces on f6 and f8. I thought that at least looks good (again, I'm the "superficial" type), unless the assessment is that the position is very closed, and that the Knight is more valuable. 25.Kf1 felt a bit shaky to me. Not that it's a bad move in itself, but because of the general guideline that the King should stay towards the short-side of the Board -- Actually, I don't see Black threatening anything major, but if the intention is to get the King out of the arc of fire, maybe 25.Kh1 is better? I know the backrank issue, but right now Black has no easy way to get the Rook onto an open file. After 27.Qe1, instead of 27...Qxe1+ exchanging Queens, maybe Black can try 27...Qh2!? Might not have any objective "win", but I think it may get a bit more tricky for White to handle, as the e6 Rook now can be relocated to g6 or h6 for double-attack attempts. After 42.Rf4, I thought 42...Rg3 is the easiest way to maintain equality. By attacking the e3 pawn, it becomes rather difficult for White King to ever be liberated. Because of this, I think I prefer 42.Kf2 -- the King defends both weaknesses on g2 and e3, so that the Rook can try to find another place where it belongs. 45...Rg3 instead of 45...Rg4 would've been interesting. I assume after 45...Rg3, White is playing 46.Bxh4 Rxe3, which is probably a better version for Black than what was played in the game. Last but not least, you don't have to feel too bad about forfeiting on time for rapid games -- Some players treat rapids as just "for fun" and only take standard games seriously. You can see rapid games as shorter versions of the game for training purpose. That being the case, we are always advised to "go all out" in training games, which is what you did here. That's all for now, hope it helps in any way, and let me know if my points are incorrect so that we can learn together! I must confess I completely missed 19... Nd5 in Game 3 and 16. Nd7 in Game 4. 25. Kf1: The intention was that with the endgame approaching, I would eventually need to centralize my king. Looking at Petrosian's famous king walks (e.g. http://www.chessgames.com/perl/chessgame?gid=1107112) also played a small part in making this decision; I was still hoping to make inroads on the kingside during the game! Finally, hats off to all your efforts commenting on mine/ Weng Chew's / other players' games; I never have been able to find time to analyze my own games, let alone look at others! Perhaps one day I shall reciprocate by looking at your games. Thanks again! To be honest, my overall accuracy in the games I commented is only about 50%, so take it with a pinch of salt. But I generally do like to "speak my mind" and stand corrected. This promotes learning, and is fun (at least to me). Round 4: 16.Nd7 can be answered by 16...Qf5, attacking back the White Queen and if an exchange of Queens 17.Qxf5 Rxf5 occur, Black is fine (no more fork). And 27...Qh2 is not winning. Yes, the engine picked this as one of the top moves, but White is able to defend everything nicely. And some other earlier views on Game 4, they are largely personal preferences. Objectively, the differences are not big.